It’s already the 2nd of December (23 days to Christmas!!!) so where have the last few weeks gone? 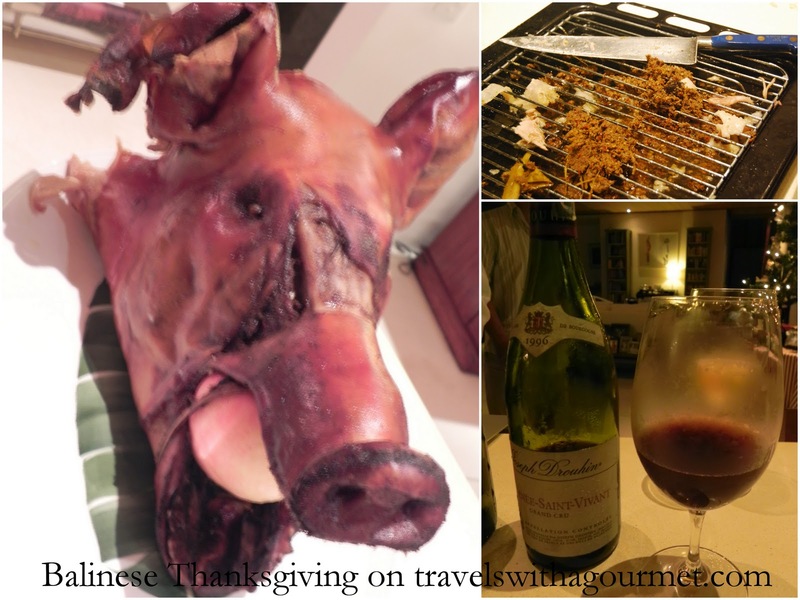 My last post was a restaurant we went to on a brief visit to Singapore and since then, I have been running around like a headless chicken getting everything ready for my family’s Thanksgiving visit to Bali. We were expecting nine guests in total (eight adults and my three- year old niece) coming from Manila and Las Vegas and I was booking hotels and cars and arranging the guest room and grocery shopping for a battalion which obviously used up most of my time. They all arrived on the Saturday morning before Thanksgiving. My mom and two sisters stayed at home with us and the rest were at the nearby Bali Hyatt. We had a very full schedule of sightseeing (Ubud, Uluwatu, Tanah Lot, Jimbaran, Nusa Dua), shopping (Seminyak, the markets), swimming (at home, Sanur beach) and lots of eating which led up to Thanksgiving dinner two days before they left. After a long discussion on whether we should eat out or in for Thanksgiving, we decided on having a big family meal at home but make a twist on the traditional meal and have a Balinese- inspired dinner with Babi Guling (roast pig) instead of turkey. As most everyone in the family loves pig (except for C who had nasi goreng to keep within the theme), we splurged and ordered a whole roast pig from Ubud’s famous Ibu Oka. All we needed to prepare at home were two vegetables (spicy string beans and stir-fried bok choy), steamed jasmine rice, drinks and dessert. Thanksgiving Thursday was spent running around doing last-minute errands and making the desserts while some went up to Ubud for more souvenir shopping and to pick up the pig. We were expecting a pig slightly larger than a cochinillo (milk-fed baby pig) and were shocked to receive a pig so large that three people needed to carry it out of the car. There went the plan to just slide the baby pig into my larger-than-standard oven to reheat. We spent a few hours carving the pig, peeling off the crispy skin and chopping the meat into large chunks so we could then place them on large oven trays to reheat. Along with the roast pig were many rolls of blood sausages which we heated in a separate roasting pan. We scooped out the stuffing – a chili, lemongrass, lime leaf, ginger, candle nut and assorted spices mix – and heated that separately on the stove too. While the food was in the oven, we opened two bottles of wine that my mom had hand-carried from her Burgundy collection – a 1999 Chateau de Rully chardonnay and a 1996 Romanee-Saint-Vivant from Joseph Drouhin. Dinner was finally ready around 7:30 when we all sat down and had several platefuls of babi guling washed down with the excellent wines. A preferred the oakey, smoky chardonnay while I enjoyed the rich velvety pinot noir. It is said that to truly enjoy a grand cru pinot noir, from seven to 15 years is needed and this wine was just right on it’s fourteenth year. We cleared our plate and figured out how to pack up the leftover roast pork, which we gave as big foil-wrapped portions to the gardener, his wife and the neighbors, then froze the rest in individual containers for later (pulled pork sandwiches and roast pork fried rice). Then we sat around talking on the terrace, enjoying the slight evening breeze and having the desserts – homemade tiramisu and chocolate chip cookies – with espressos. Thanksgiving is about family and giving thank so here it goes. Thanks to my family for coming over to Bali. 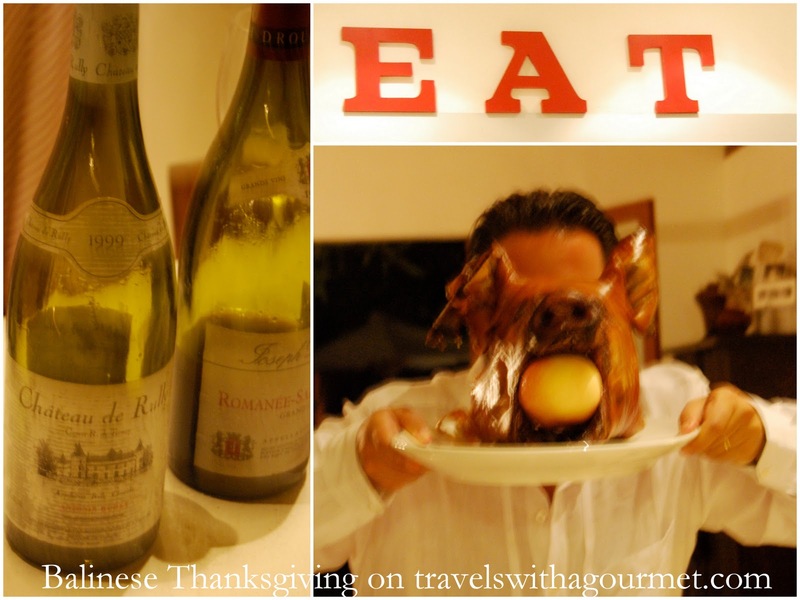 Thanks for the wonderful babi guling and the unforgettable wines. Thanks for the lovely holiday memories and photos. That’s what Thanksgiving, wherever or however it’s celebrated is all about. You got that right! Roast pork is pretty special. It was a lovely Thanksgiving.